Today my husband humored me as I jumped back into my crafting and DIY days. There was a time when a pile of wood, old tile and paint would have forced me to do something with them. With the passage of time, and the onset of third child, I tucked that side away. Today, my husband hooked up the trailer and drove me over to Huntsville to pick up a full load of pallets. I have plans for those pallets. On the way home, we stopped off at a supply store and they had some extra spools that they were more than happy for us to take off their hands. I am certain that my happy dance and giddy giggles did nothing to motivate their offer. And so, the quest begins. 1. There are no “real” directions. Yes, you can download directions from the internet – but there are as many options as there are websites. Get your ideas and then give your ideas a try. Pallet furniture is an adventure. 2. Schedule the work and not just the delivery. When I asked Facebook for places to get pallets, several folks messaged me about piles their loved ones had accumulated. My own pile has now been sitting there for three days, but today that all changes. 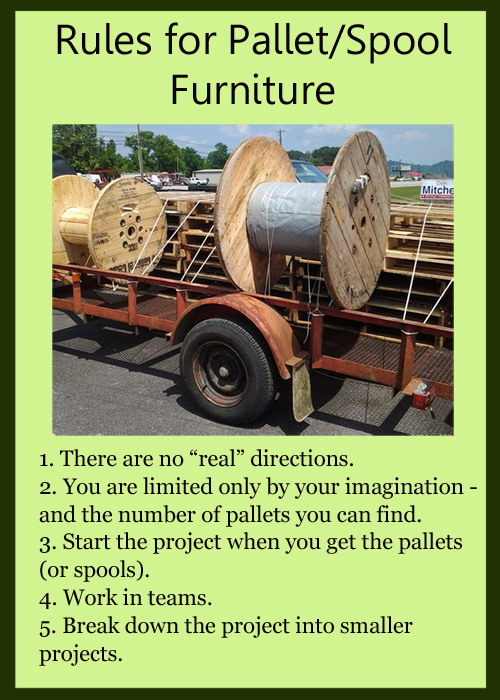 Getting the pallets can be the easy part. Doing something with those piles appears to be the challenge. Schedule out the work and then arrange a pick up. 3. Get others involved. Big projects, like pallet furniture, are more fun when you do them together. Make plans with some friends to create the furniture together. Tag team with others that are more talented (or have the resources) for other portions of the project; you make the furniture and they make the cushions or she builds, she paints and he sews. 4. See the pieces of the project as individual project (but remember to stick to rule #2). I may not be able to find a whole day or a weekend to work on these projects. I can find an hour each day to work on them. An hour each day, given consistently, will add up fast. I am excited about this next step in my journey. It has been a long time since I allowed myself complete freedom for a project like this. In the past, I would put my all into it – only coming up for air when I had to. During the 30 Day Family Challenge, I learned that by committing just a little each day, I still get there and I am not burned out (or my husband frazzled to his wit’s end) by the time I am done. Do you have a project you want to take on? Have you some great idea for pallets or spools? Maybe you have already completed your project. No matter where you are in the process, I would love for you to share your journey (or a piece of your journey) with me. I will share my progress AND the number of hours invested with you on this project and many more to follow. Comment below and be sure to include a link to any posts or pictures.